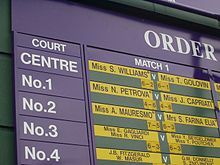 ^ Wimbledon prize money up 40% and roof planned for Court One. BBC News. 23 April 2013 [22 June 2013]. ^ The Championships, Wimbledon 2009 - 2009 Prize money 互联网档案馆的存檔，存档日期2009-06-12. ^ Newman, Paul. Wimbledon prize money to be increased to £28.1m. independent.co.uk. 27 April 2016 [1 June 2016].